With plenty of modern options for interior decor are owners still reluctant to compromise authenticity? The use of unusual materials on superyachts, in all their multifarious forms, is one of the aspects which epitomises the refinement of the industry and its eccentric interior design trends. From amethyst to sting ray, there is no vehicle more suited for alternatives to the most sought-after materials than a superyacht, where design tends to be more adventurous in comparison to other fields. When it comes to sourcing and installing these materials, there are many aspects that make their inclusion problematic in terms of practicality and cost; this means that finding a substitute may be the better option. However, is a more functional, practical and utilitarian alternative really a viable sell to clients? Exotic materials are attractive not only because of their unusual textures and finishes, but also because of their rarity that makes them such a popular addition to a superyacht interior. 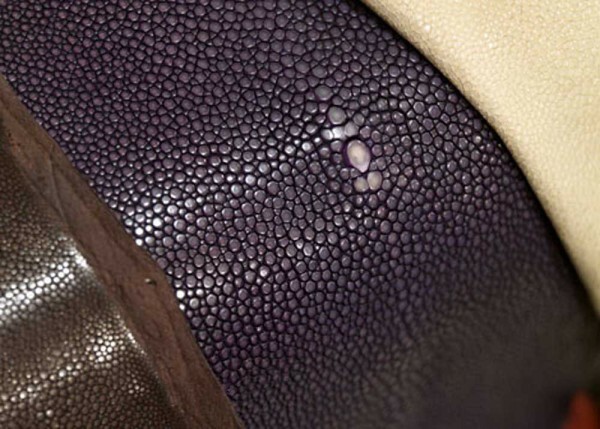 The unusual variations of leather include alligator skin, taken from the animal’s underside; lizard skins; stingray, which creates an interesting beaded texture that has to be treated to achieve the desired soft effect; ostrich skin and many more. 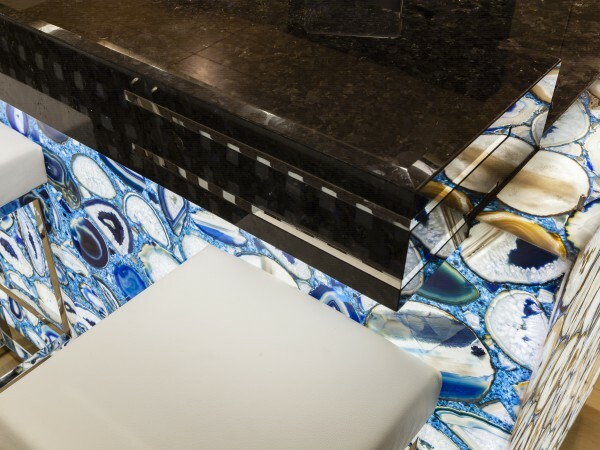 For stone, the likes of deep purple amethyst, countless styles of marble, onyx or variations of agate can be all manipulated to create a range of effects such as finely sliced and installed on a baseplate to create a back-lit stone surface. In terms of practicality, complications can begin very early on in the procurement process for materials of distinction such as exotic leathers, which are not only difficult to track down but also come with an array of logistical nightmares. The importation of exotic leathers, for example, is heavily regulated by the Convention on International Trade in Endangered Species (CITES), and quite rightly so as unfettered access to the globe’s diminishing wildlife stocks would only end in devastation and the extinction of some of the world’s most precious species. However, as with the correct certifications, most exotic materials can be sourced, even if they are likely to arrive within a tangle of taxes and duties. This view is supported by the interior production department at Oceanco. “The interior of an 80m-plus yacht is difficult to compare with any loft, villa or even supercar – it is the ultimate in sophistication, so no material can replace leather, marble or gold,” says a spokesman. “Clients expect their yacht to be built and decorated to the highest standards and this means with the top luxury materials. In some cases, however, we use a teak alternative such as Bolidt for tender garages only as it’s very easy to clean and maintain.” Many owners will insist that authentic animal hides are used on board, which means that the price is likely to increase significantly in comparison to replicated leathers or teak. More practical options do have a place, however, such as in a tender garage, somewhere unlikely to be seen, let alone used, by the client while on board. Once the desired materials have been successfully sourced and are ready for installation, the practicality and fragility of the desired material become the next hindrance in the process. “Some of the materials are incredibly difficult to install and require mostly specialised work,” says van Hirtum. “Difficulties often arise due to the specific way a client or designer wants to have the material in the interior. The special materials required are often used in much smaller items, such as jewellery handbags, small tables or cabinet ware and it’s not easy to create the same effect on a larger surface.” The labour-intensive demands caused by the refined materials, in addition to the cost of the materials themselves, is where the expense of the interior can increase exponentially. A stingray skin costs €250 to €350 each and you have only 250 x 100mm net material, therefore a bigger cabinet might need more than 200 skins, and this is only the material cost. Unfortunately, natural materials such as exotic leathers and stones like onyx, which is naturally brittle, and other forms of quartz, are subject to breakage during installation, which again will have an impact on cost. “A popular material at the moment is stingray,” says van Hirtum. “The skins are very small and there is a kind of bone in it which makes it very difficult to work with. 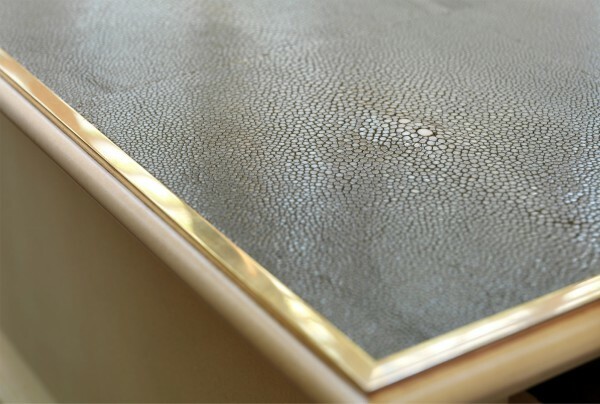 A stingray skin costs €250 to €350 each and you have only 250 x 100mm net material, therefore a bigger cabinet might need more than 200 skins, and this is only the material cost.” This means that per square metre of stingray skin, the cost can range from €4,000 to €10,000. Stingray skins also have to go through an extensive treatment process to create a soft texture because unrefined stingray skin has a particularly rough and grainy surface and can splinter when cut to size. As a result, a sanding and conditioning process is used to soften it and make it easier to work with. However, vastly increasing the cost because of the materials doesn’t necessarily have to be the case. 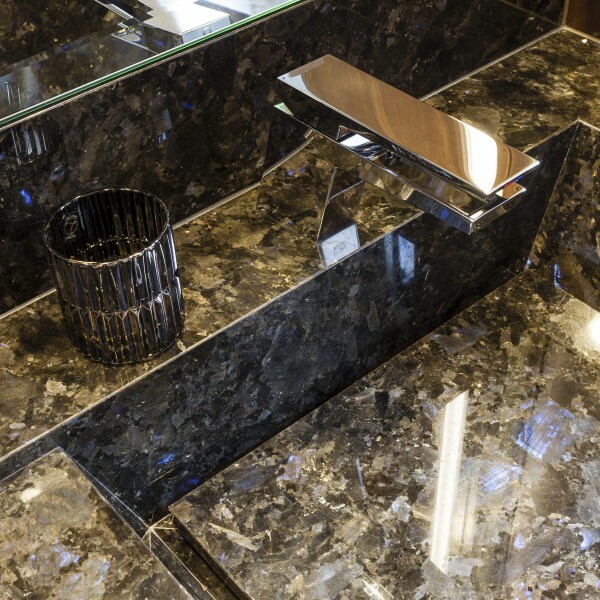 While replicating the desired materials may result in a lack of ‘richness’, the Oceanco interior production department says that opting for interesting alternative materials, rather than a compromise, is how to avoid great expense. “We recently saw a special 3D-cutting technique with leather, giving a totally new look to it; very modern, very different but not expensive. Oak can also be treated in a special way to make it look exceptional, not as expensive as bubinga wood, but very unusual and original.” There is so much room for experimentation that creating an entirely new finish or texture is not unheard of and is a good way to avoid the costs that go hand in-hand with sought-after exotic materials. It’s clear that there is a correlation between exotic materials and an increasing cost. From their procurement and importation to treatment and installation, there are many factors that make their inclusion problematic. However, alternative options still don’t seem to be a viable sell to clients who have their heart set on a particular finish on board and are not prepared to compromise. Despite the increased costs, the subject of authenticity plays a massive role in interior design to the extent that owners are willing to go to vast expense to have exotic materials on board. While there may be brilliant imitation leathers and weight- management options available, they are clearly no substitute for the most refined superyacht interior. This is an extract from an article in issue 174 of The Superyacht Report out now.